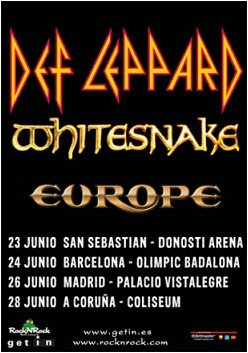 The local press in Spain have today announced a four date tour featuring Def Leppard, Whitesnake and Europe in late June. The heavily rumoured run of shows includes expected dates in Barcelona and Madrid as well as San Sebastian. The band will also be playing in La Coruna (A Coruña) for the first time. View all the dates below. Various press outlets speculated on these dates after they were first mentioned by Vivian on facebook. The four shows will be the first in the country since the band played Madrid on 28th October 1996 during the Slang tour. They will also be the biggest shows here for 20 years since the May 1993 Adrenalize tour dates. Lep last played with Whitesnake at Download 2009 and before that the 2008 Songs From The Sparkle Lounge, 2006 YEAH! tours and at Reading 1980. Europe supported them during the outdoor leg of the 1988 Hysteria tour with their last show played on 21st August 1988 in Phoenix, AZ. Both bands will of course be playing with Lep before these shows in France at Hellfest. It's not yet been confirmed if the band will play the 'Hysteria' album at these shows. 16 shows have now been confirmed for 2013. Tickets for these shows go on sale on 5th March via Ticketmaster Spain.